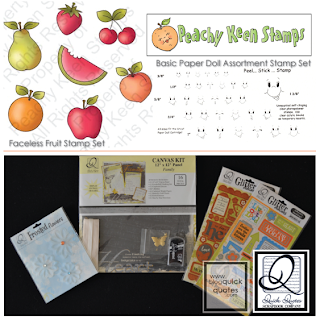 Peachy Keen Stamps and Quick Quotes have partnered this weekend to bring you incredible creations from both Design Teams. You'll see how versatile our products truly are! We hope you'll hop along with us both days (Fri & Sat). Each day features different designers and projects. Plus, if you leave comments both days, you will have double the chances to win the grand prizes. This should be your last stop on the hop for DAY 1 (9/16). If you need to start today's hop at the beginning, please head over to Peachy Keen Stamps. Lisa - "I am super picky about my clear stamps and the images they create. Peachy Keen Stamps has been added to my short list of favs." Rhonda - "I have to tell you, these stamps are amazing quality! They are really firm and create such a crisp and beautiful impression!!!" You can use Quick Quotes Powder Puff Chalking Inks to stamp with. Just one more reason they are a must-have for the design team! The best way to get a super clear image is to stamp on a foam mat. *The deadline for commenting is 11:59pm EDT, Sunday, September 18th. Check back here on MON 9/19 when the winner will be announced. **See prize disclaimer at the bottom of the post. Thanks again for stopping by! We hope you enjoyed Day 1! Be sure to join us tomorrow for Day 2 (we are stop #1)! Thank you for all those beautiful ideas, the DT did a great job and thank you for the giveaways. thanks for the hop! I didn't see the join this site to click on to join you on here! I will look again! it was fun and some great stuff! Thanks for letting me work with your beautiful papers and quotes and for the fun hop! Thank you so much for this combined blog hop! Loved all the projects I've seen, and I have loved to opportunity to work with the QQ products. I'm up for hopping tomorrow, and I'm really looking forward to it! Thanks for the hop!! Im already a follower here! Thanks for the feedback :) Donna shouldn't have been on the Peachy Keen's hop list, they are fixing it right now. The hop list above is correct :) Julie is also fixing hers right now! Thanks ladies!!! What an awesome hop! I had a great time visiting all the different site and seeing what everyone created. They all did a phenomenal job! Thanks for the fun hop. Some of the blogs did not reference the hop and others would not let me leave a comment with my Google account (like this one! ), so I left one with my email address. hopefully, that will count. Finished up day 1 of your blog hop. Loved all of the fantastic projects. Looking forward to tomorrows. This was a fun hop so many awesome projects to inspire me. thanks for the chance to win some awesome products. Such a great hop, Thanks for the chance to win. I just liked you on FB. Thanks for a great hop, and for a chance to win. WOW! What a great hop!! So many fantastic projects! Your papers are beautiful!! Thank you for the chance to win! Have a blessed weekend! Thanks for the hop. I am already a follower. Will check back for day 2 tomorrow! Hops & QQ are great!! Such inspiration and so many talented people!! Thanks for the hop!!! I am a QQ follower now and forever!!! I love all the amazing patterned papers everyone used!! Thanks for co-hosting this blog hop. Awesome Awesome Awesome projects. I love every single one of them. Very talented. Thank you for this fun hop and the goodies. Im a new follower. Great hop, can't wait until tomorrow. I am now following this site. Already a follower! Thanks for the all the great inspiration! Hops are great bc you meet bloggers that you would not have stumbled upon! I am already a follower! Day one was amazing! Can't wait to see what day two brings! Im a new follower.Glad to have found your blog. I love all the DT projects. There are so many great ideas. It's hard to choose from. THanks for the chance to win. Im also a new follower of your FB page. I am a follower her. Loved today's hop. I am already a follower. This was my first hop and it was a lot of fun. all the projects were great - the use of color is something that I really liked. I am having some issues posting under my google account on some sites so hopefully this goes through or I will have to use a different method. Thanks for the opportunity to win! I love QQ!!!! Great hop, thanks for co-hosting. So many talented designers. Now I have lots of ideas for new projects. I'm a follower of the QQ blog and FB page. I am a follower and made comments on the hop. I love the variety of projects everyone made. Nothing like a good hop. Thanks for all the inspiring projects. Great to have chances to win. What A great hop, thanks so much! I am a new fan on FB and already a follower here. I am looking forward to day 2.
great hop. wonderful designers and tons of inspiration. i'm a new fb fan as well as a new follower. by the way, i found your chalk ink while vacationing in san diego and fell in love with it. it's the best chalk ink i've ever used. hope you'll have more colors in the future.